A construction foreman supervises and coordinates the work of a crew of workers on building projects that range from small projects employing only a few people to massive projects employing many. They are primarily concerned with seeing that the workers under them do their job skillfully and efficiently, and that assigned work is completed on time and within budget. They deal with the routing of material and equipment, and with the laying out of the more difficult areas of the job. interpreting and explaining plans and contract terms to administrative staff, workers and clients; planning, organising or directing activities concerned with the construction or maintenance of structures, facilities or systems; investigating damage, accidents or delays at construction sites to ensure that proper procedures are being carried out. What does your profession involve? My function starts right at the beginning of the job and carries through to the end. It involves everything, from ensuring straight foundations, to setting out and working the levels to a certain height according to the plans, overseeing colleagues (I manage around 30 labourers), managing subcontractors, working on roof heights, right down to the finishes – details like tiles and cupboards. How did you get into it? My father was a bricklayer, and from when I was about nine years old I would spend school holidays on site earning pocket money as a labourer. I didn’t like the effect the years of hard graft had on my father – he suffered back problems from all the physical work. He urged me not to follow in his footsteps, so once school was over I fell into tiling, which I did for a few years. While I was tiling, I witnessed countless struggles taking place between clients and builders. I noticed the lack of attention to detail, the faults and poor workmanship. A few years later I was introduced to Yule (co-founder of Katull Projects) and he offered me a position as foreman. What training did you do? On-the-job training. Everything I know is thanks to experience. What characteristics make for a good foreman? You have to be strong, hard but not too hard. It’s about balance, about not being overpowered. I’m a soft person by nature and am a different person at work to who I am at home. The labourers need to know who’s boss. You definitely need to be a good communicator. Describe a typical day Every day something goes wrong and I feel responsible! Mistakes mean cost implications. You need to be constantly on the ball. The daily routine depends on the job and the stage it’s at. My work involves all aspects of the job. Best parts of your job? I love my work, there’s nothing I don’t like. I love being outside, not sitting in an office, and working in all sorts of different places. I’m happy working for someone else too, I prefer it to always having to look for more work and struggling to meet payments. As long as I can put food on the table for my family and take the kids to the doctor, I’m happy. I believe money is evil, it changes personalities. What don’t you like? Winter, when it’s cold and wet. Some words of advice? The same advice my father gave me: don’t do hard labour. Choose a trade and become good at it. Be humble, work hard, always be prepared to learn and to take direction from others. Construction foremen may receive their education from many different sources. Many employers require only that a foreman have a Grade 10 or National Senior Certificate, management experience, and experience with some of the technical aspects of a building project, such as carpentry, concrete work, plumbing and electrical work. 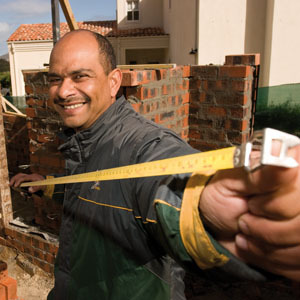 Others prefer to hire foremen who have a formal education, such as a degree or diploma in construction management. The advantage of studying a building diploma at a technical university is the opportunity to earn a salary and gain experience during the practical training, while continuing to learn the theory part-time.